My name is Anna Domok Szalai. I would like to introduce the puppies in the Gold and Brill kennel to you. We started our kennel twelve years ago with our mother dog Suti (translated means Pastry). Her daughter Fuge (translated means Fig), was the second member of the pack. Cuki (translated means Candy) is the third and youngest member of the litter, she is the funniest of all. As you can see from the pictures, all three dogs are amazing and truly have become a part of our family. I will now try to explain all the important details concerning our kennel. Let me be honest, and say that it was truly by accident that I came upon the Tibetan Terrier breed of dog. I happened to be watching a television show and saw such a cute dog. His name was Benji. You may even remember the dog yourself from the movie he later became famous for. He was the cutest, sweetest, most soft, looking little puppy with big round innocent eyes that just called out my name and I wanted that dog to be my own. Not too soon after seeing this show, I began to follow that dream dog of mine. I started to scan newspapers, call friends, ask people in stores, just about anywhere I could search to find this dog. But, alas I was soon to realize that I will never find Benji (one of the most famous dog names). To my amazement and surprise through all my searching I came upon a very unique breed that was relatively unknown. Amazingly, right near my very own home, someone was taking their dog for a walk. When I spotted this dog, I knew this breed of dog was my destiny. I found the dog of my dreams. I walked up to this man and asked him "What kind of dog is that?" 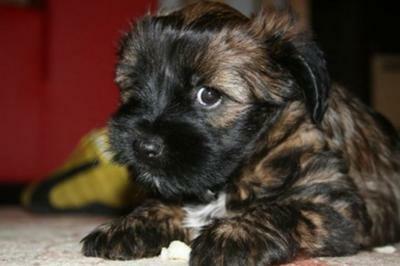 He responded by saying, "this is a "Tibetan Terrier." I began my search for this breed. No long thereafter, I found my dog. We named her, Suti, and found her in the small town of Szolnok in Hungary. Suti was a fast learner, especially when she was in the mood (which is most of the time because this breed loves dog tricks). In the beginning, I realized that this dog was very unique, because I had to talk to her with gentle, kind, soft words, being patient because if I raised my voice she looked shocked and stopped doing anything at all. I quickly realized that she has her own personality. A quiet and gentle natured dog, friendly to the end. At age three, we felt she was ready to become a mommy. I took her to a breeder and she was licensed to have a litter. After that we searched high and low for the perfect mate for Suti. She was an excellent mother, taking care of her puppies came naturally to her. She protected the puppies like a lioness would protect her cubs from danger in the jungle. For days on end she did not move from the side of her little puppies. If she left for one second, she was looking back with the other eye to make sure no danger was lurking against her babies. Over the years she has had four litters. Suti is now in her golden years ready for retirement, yet she is still playful and funny and ready for a romp to play with other puppies. On the other hand, she can't wait to be held, and petted and loved by her family. The breeding has been taken over by her daughter Fuge. I picked Fuge from the "C" litter in October, 2003. It was very hard to decide which puppy to chose, because each one had something very unique and special to offer for the breed. Ultimately, Fuge won for her outstanding beauty and poise and distinct features and personality. She has had two litters. Fuge has become a leader in her class. The newest and youngest member of our Kennel is Cuki. She is very adventurous, playful, kind, and makes our days special filled with fun and laughter. She is also very smart and enjoys learning new things and tricks daily. It took only moments for her to learn how to walk and present herself at the exhibitions to win the hearts of the judges. She has already won the junior championship. 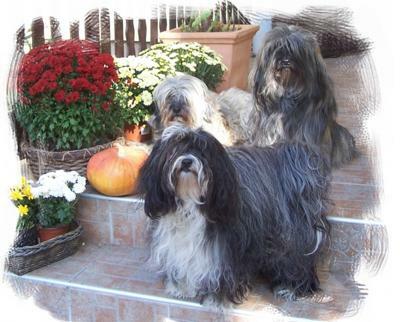 Should you be interested in this kennel and the Tibetan Terrier breed or have any questions about these dogs, please contact me and I will get back to you with all the answers as soon as possible. If you should fall in love with this breed immediately, as I did when I first saw them, please get in touch with me so we can arrange to have your special dog shipped to you. 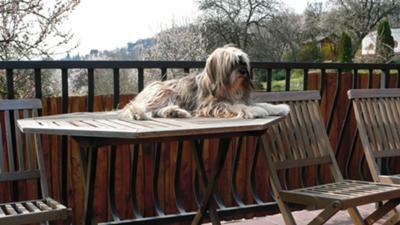 Your Tibetan Terrier will bring you so much joy and love to your home and family. The dogs come equipped with a microchip, they have been given all the necessary vaccinations and they have passports as well. Of course, you will be receiving their pedigree papers. There is no problem in transporting the dogs to any country in the world. Please look at the pictures on our website and the other information available and we look forward to hearing from you.